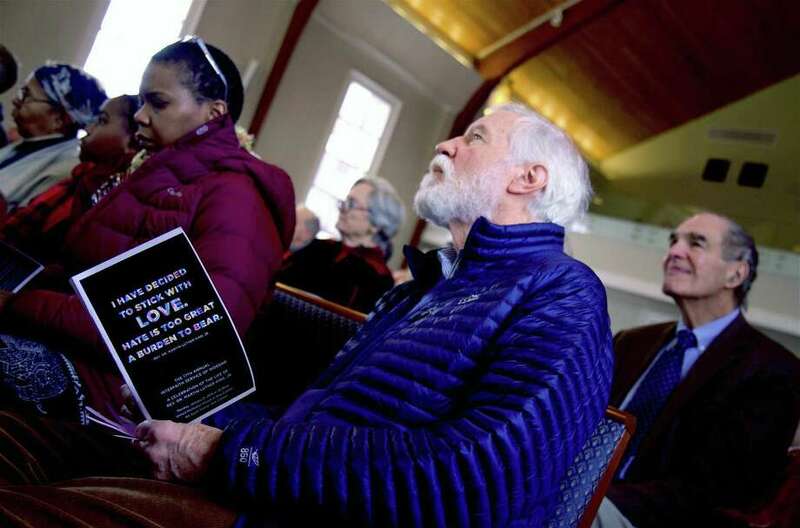 Worshippers were in good spirits at the 17th annual Interfaith Service for Martin Luther King, Jr., at United Methodist Church, Monday, Jan. 21, 2019, in New Canaan, Conn.
NEW CANAAN — To celebrate and honor the legacy of Dr. Martin Luther King Jr., the Interfaith Council of New Canaan hosted its 17th annual community worship service at United Methodist Church on Monday morning. The sanctuary was full, which various local organizations and congregations represented. “I appreciate the history of this celebration,” said keynote speaker Rev. George Walker Jr.
A former advisor to President Barack Obama, he spoke of the passion everyone needs to find to pursue their dream and mission in life. “It wasn’t about greatness for King,” he said, but the passion of his beliefs. Other speakers included Ryan Hernandez, an A Better Chance student from New York City who is attending school in New Canaan. “The world isn’t perfect,” he said, noting there are still people who practice hate and negativity.